LightRocket is proud to be partnered with the world's leading provider of digital media, giving selected contributors a valuable professional channel for distributing their editorial work. If you would like to be a part of the LightRocket collection on Getty Images you'll need to be a premium member with an annual subscription to our service. You'll need to be producing a regular flow of high quality and relevant editorial features and to have an existing archive on LightRocket of at least 500 images. And you'll need plenty of talent too. You must be logged in to make a submission and please note - Your application is unlikely to be successful if you don't have at least 500 images on LightRocket and your application is more likely to be successful if you have a well edited portfolio (avoid repetition and show off what you do best in less than 50 images) and plenty of published galleries on LightRocket. Also if you are already submitting images to an agency that is uploading them to the Getty site, it is unlikely that your application will be approved. How do I apply to be a Getty contributor? To apply you'll need an annual 'premium' subscription to LightRocket. You will also need to show a commitment to LightRocket as a regular contributor of good editorial imagery, especially news, current affairs and features. You don't have to be a 'news photographer', but it will certainly help your application if the work you upload to LightRocket includes topical stories and work of an editorial rather than creative nature (imagery intended for commercials uses such as advertising). It is worth noting that your application is unlikely to be successful if you don't have at least 500 images on LightRocket and your application is more likely to be successful if you have a well edited portfolio (avoid repetition and show off what you do best in less than 50 images) and plenty of published galleries on LightRocket. Also if you are already submitting images to an agency that is uploading them to the Getty site, it is unlikely that your application will be approved. You should also look at the 'Getty Contributor Agreement Highlights' FAQ section below to see if becoming a Getty contributor works for you. If you are happy with the deal being offered, browse to our dedicated Getty page and submit links to one portfolio and two galleries for review. Getty's editors may take a few weeks before making a decision so be patient and take care not to remove/unpublish submitted work from the LightRocket site as this may invalidate your application. Once a decision has been taken you will receive a notification via email from LightRocket. What happens if I'm accepted by Getty? If you're accepted by Getty you'll be sent a sample contributor agreement, a sample Getty non-exclusive amendment and a contributor form. If you're happy with the agreement and want to proceed, you can confirm your acceptance by sending a confirmation email to info@lightrocket.com with your completed contributor form attached. You will then receive an introductory letter from Getty and a signing guide. The final step is to log in to Getty's photographers portal and complete the sign up process. Why did Getty reject me? A rejection by Getty isn't necessarily a reflection of the quality of your work. Getty's editors have a number of criteria when selecting new contributors. Your collection might be similar to content Getty already has. Or it may be that your style, though unique and artistic, doesn't match Getty's requirements in terms of what might sell. Black and white photos, for example, while often powerful and artistic-looking are often not easy to market to picture buyers. If your pictures lean more towards the creative/commercial side of things, they probably won't fit with an editorial collection. Or it could simply be that you do not have enough recent work on LightRocket. Getty wants contributors who are going to submit new work on a regular basis. Can I re-apply if Getty has already rejected me? You can re-apply any time but it's probably best to make sure you've got some strong new work to show before re-applying. Although you submit just one portfolio and two galleries, Getty's editors will often take a broader look at an applicant's work. So before re-applying, and to reduce the risk of another rejection, we recommend taking a long hard look at your existing collection and making sure you have something new for review. Selling photographs online is a very competitive business. If you're accepted, the financial returns of putting your work with Getty will depend partly on how strong your work is, partly on whether the subject matter you have covered is in demand at any given point in time and partly on the quality of the metadata (captions and keywords etc) associated with your images. Accurate captions and keywords will help potential buyers find your work and increase your chances of making a sale. In addition to all of these factors, it's worth remembering that if you are accepted as a Getty contributor you will have an opportunity to place your work on one of the most successful platforms for digital photography in the world. Commercial photo agencies like Getty pay commission, known as a 'royalty', on the revenue they collect for licensing your work. This is a standard model in the photo industry. The percentage commission an agency will take varies however. In Getty's case you will receive 35% of each sale. This is not the highest split in the industry but it is worth remembering that Getty's platform is generally considered to be the most successful. The sales split is the same for all LightRocket members accepted by Getty and is non-negotiable. Is the Getty agreement exclusive? No it's not. LightRocket members accepted by Getty can contribute imagery to Getty's LightRocket Collection on a non-exclusive basis. The Getty contributor agreement is a blanket agreement for all types of imagery and video footage for all license types. The agreement's default is the right to license accepted images and 'similars' on an exclusive basis. However LightRocket contributors will receive an amendment document that nullifies this exclusivity – you will be signing a NON-EXCLUSIVE agreement for rights managed editorial images. So can I give my work to other agencies and outlets? This non-exclusivity means that if you have images and galleries on LightRocket or other sales platforms, you are free to submit the same material to Getty too. While this gives you a lot of flexibility, however, you might want to think strategically about how your work is distributed. If your best imagery is on too many platforms, clients might get confused or you might end up making sales through the agent selling your work for the lowest price. What happens if I want to leave Getty? You will be signing a one year agreement with automatic renewals for successive one year periods. You can terminate the agreement any time you want by giving 90 days written notice. Getty can terminate the agreement at the end of the first year or at the end of any subsequent yearly renewal provided they give you 90 days written notice. What happens if I'm a Getty contributor and I leave LightRocket? When you leave LightRocket you'll no longer be able to submit your work to Getty's LightRocket collection and, of course, you'll no longer be able to use the LightRocket platform for submissions. Whether Getty will continue to market and license your work if you terminate your subscription to LightRocket will be at the discretion of Getty and/or LightRocket. How quickly can I have images removed from Getty? If either you or Getty decides to terminate the agreement, Getty will make reasonable efforts to remove your content from its systems within 90 days. It should be noted that Getty also has a one-time-only right (five times if the license is educational as educational publishers often re-use images in their publications again and again) to renew licenses on essentially the same terms. Getty will continue to pay you for any licenses made during this 90 day 'wind-down' period and for any re-licensing of your work. Do I need to read the Getty agreement? Yes. The contributor agreement is a formal contract with Getty. You should be sure you understand it before signing. Though our FAQ's are intended to be comprehensive they are not a substitute for a careful reading of the actual agreement. Since we only send out sample contributor agreements to accepted photographers, however, you will need to base your decision to apply to Getty on the information provided on the FAQ page - so do have a good browse. You will be paid directly by Getty. When you sign up with Getty, you'll need to provide payment information. Paypal is a good way to go. During enrollment you'll be asked to provide electronic banking info. After you've enrolled you can update your payment details via the account management tool if you'd prefer to be paid from Paypal. If you have outstanding sales – and a balance above US$ 50 – Getty's preferred method of payment is by transfer direct to your account (they pay for transfers). You'll receive an electronic statement detailing which pictures were licensed and various license details. Typically sales are reported about a month after they were recorded by Getty and are then paid about a month after that. What type of licenses is Getty selling? All licenses granted for photos from the LightRocket collection on Getty are 'rights managed'. This means Getty will define specific and limited rights in return for an appropriate fee. Typical measures of usage relate to size (1/4 page, 1/2 page etc), position (home page, cover, inside page etc), print run (if relevant), duration of use and geographic distribution. This allows Getty to retain much tighter control over how, where and by whom your work is used. Remember, though, by agreeing to become a Getty contributor you are empowering Getty to license your work on your behalf. They won't be able to come back and ask if a specific license is OK.
Will Getty send my images as a 'feed' to clients? Yes. Editorial publications working on deadlines expect images to be 'pushed' into their systems every day by Getty and other services, so that your images can be seen by editors around the world right away. But rest assured, these feeds are not part of a 'subscription deal', any use by their clients will be subject to fees based on the rights managed pricing agreements Getty has with each customer. What does aggregate licensing mean? As Getty adapts its business to changes in the industry, it has sought to move into areas where traditional pricing models don't work. This is particularly true where the use of images on the Internet is concerned. 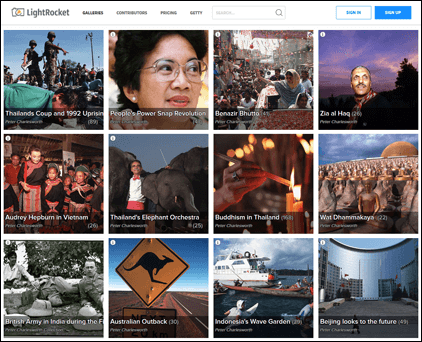 The recent launch of Getty's 'Connect' service has created a new opportunity to generate revenues from content viewed alongside ads on client sites or simply based on traffic. Through an API (Application Programming Interface), 'Connect' clients are literally connected to Getty's editorial collection. This sales model is known as 'aggregate licensing'. You will receive a percentage of the revenue Getty receives for views/clicks of your images on a 'Connect' client's site. This will show up as a single line item in your sales report detailing your share of revenue for a given client in a given period. A word of warning though, don't expect a windfall. Individual revenues from aggregate licensing deals are likely to be quite small. Can Getty use my images without paying me? It is standard industry practice for agencies to be able to market themselves and their photographers using the images that are submitted to them without payment. Getty and their distributors will need to be able to use your images to market you and your work. No royalties will be paid on these marketing uses. Will I be credited when Getty licenses my images? Photographer Name/LightRocket via Getty Images. Will Getty be licensing my pictures for advertising and commercial uses? The LightRocket collection on Getty images is purely editorial. Getty won't be marketing your work to commercial clients. However it is always possible that one of their clients will purchase a license for commercial use, provided the image(s) does not require any kind of release or the client accepts responsibility for using an image that does not have the relevant release clearances for commercial use. Do I need model and property releases? Editorial imagery doesn't generally need either model or property releases. Although there might be some instances where the subject matter is sensitive when a consent form could be appropriate. Can Getty chase unauthorised use of my images? By signing the agreement you will be authorising Getty to take action, including legal action, against unauthorised use of accepted images and claims relating to copyright infringement. If they do proceed with a claim against a third party, it will be at Getty's expense and they will pay you royalties on any amount received in settlement. You do. Ownership of your work is unaffected by signing an agreement with Getty. The agreement very clearly states that Getty makes no claim to your copyright. You are merely granting a right to license your work. What happens if I am paid too much? If, for example, you are paid for a use of one of your images that is subsequently cancelled by a client and reimbursed by Getty, or you are mistakenly paid for a client's use of somebody else's image, Getty reserves the right to deduct these payments from your future sales, provided Getty has informed you of such overpayment within one year of its occurrence. Will Getty withhold taxes from my royalty payments? Possibly. If you are accepted as a Getty contributor, when you sign up you will have to provide information about where you pay taxes. If you are neither a US citizen nor a resident alien, Getty will have to withhold 30% of any royalties you make from US clients unless there's a treaty benefit between the country in which you pay taxes and the US. If you live in a country where there is no tax treaty with the US, you may be able to claim a tax credit against the amount that was withheld. What type of imagery is Getty looking for? Getty's editors want recent editorial stock photography, features that relate to current affairs and, of course, original coverage of key news events around the world. As a general rule, to improve your chances of making sales, it's a good idea to keep your submissions 'fresh'. Try and establish a regular feed of imagery to Getty. Even though Getty is famous for its news coverage, you don't need to focus on news. Original feature stories illustrating burning issues that aren't yet grabbing the headlines are perfect. Getty wants imagery and features that will capture the attention and imagination of picture editors grown numb from reviewing images pouring onto their screens from around the world. Can I submit some of my older stock too? It's fine to submit older stock but as a rule it should have either an historical or timeless quality to it. There are some generic subjects that don't really change such as pollution, population, indigenous people and culture. Pictures of the natural world, if the subject is unchanged, clearly fall into the 'timeless' category. If you have pictures of historic events - disasters, celebrations, riots, wars etc - you should submit them too. Even pictures that illustrate a particular fashion, style or technology associated with a period of time are ok to upload. So if you've got good pictures of people using Walkmans in the 80s, or wearing flares and tie-dye t-shirts in the 70s etc. upload them for review. It goes without saying that pictures of famous or infamous people throughout history are of course great stock and should be included in your submissions. Is it better to submit photo stories or single stock photos? Both are fine. If you submit stories, there's more chance Getty will be able to actively market your work. It's much easier to pitch an idea for a story than to promote generic stock. Depending on the type of imagery you submit, your work will have more or less longevity in terms of sales value. If you're shooting a hot news event, you might find there's only a fairly a short window of opportunity for sales (until it becomes historical…). So it's probably a good idea to find a balance between timeless stock, current events coverage and photo stories, which are often easier to market. Who decides what goes on the Getty site? Getty's editors will decide what goes live on their site. They have a good idea of what is already in the archive and of what sells too. Don't be disappointed if not everything you submit makes it through to the Getty site. How will I know which images have been accepted by Getty? You will need to search the Getty site using your name. What is meant by editorial content? The LightRocket collection on Getty is editorial in nature. Editorial content is for informational purposes. This typically means pictures that are in the public interest and specifically not for commercial or promotional purposes. The kinds of clients that publish editorial photos are magazines, newspapers and book publishers. So news coverage is fine, feature stories about real life events are fine as are stock photos describing real situations. Editorial submissions carry an ethical responsibility. Because their purpose is to 'inform', editorial images should be as faithful to reality as possible. Your submissions to Getty must not be digitally manipulated or distorted in ways that could be misleading for the viewer. File Size - At least 3000 pixels on the longest side. You can of course upload files that are larger than this, but if you are accepted by Getty our system will not allow you to send images that are smaller. Metadata - All images submitted to Getty must contain comprehensive metadata. This means they need to have at least a caption/description, basic keywords (see keywords section below), a location and a date. Quality - You'll also need to make sure your pictures are clean - meaning they are free of blemishes and dust. You should also check your files are not clipped either in the highlights or the shadows. What should I include in a caption? The golden rule when it comes to writing captions is to include the WHO, WHY, and WHAT of the picture (we'll automatically add the when and where for you from the information you supply in the created date and location fields). You should include as much of this basic information as possible in the very first sentence. The more relevant and accurate information you can squeeze into the first sentence of your caption, the easier it will be for clients to find your images - and for you to make a sale. Additional sentences can contain more generic information about the image or in the case of a story or feature, information that pertains to all of the images. Getty searches on editorial pictures emphasise terms in the first sentence of your caption. So do make sure you've got the 'who', 'why' and 'what' of your picture in that first sentence. When it comes to keywording, we recommend you keyword for Getty as you would normally. Remember quantity is not a virtue. The most important criterion when selecting keywords is the relevance of the term to the meaning of your picture. For more advice on keywording we recommend you read our Keywording Tips on the LightRocket Blog. Does my image metadata have to be in English? Currently Getty is only accepting images that have metadata (captions, location info, keywords etc) in English. How do I upload to Getty? If you're an accepted Getty contributor you can only upload images via LightRocket. You will need to inform us when you have files or stories that meet all Getty's size and metadata requirements and are ready for upload to their site. We will provide further instructions to accepted Getty contributors. Can I upload videos and other digital media? No. The current agreement between LightRocket and Getty is for photos only. Can I set any restrictions to my Getty submissions? The short answer is, yes, but it's all or nothing – you will not be able to restrict particular images, but can set a restriction on your entire submissions. If, for example, you have an exclusive agreement with an agency for a particular territory or country, you would need to inform Getty when you join that all of your submissions should not be made available to clients registered in that territory or country. Once set, there are no exceptions; all of your images will no longer be available to those clients going forward. If you wanted to remove this restriction you would need to ask Getty to change the restrictions for your entire collection.